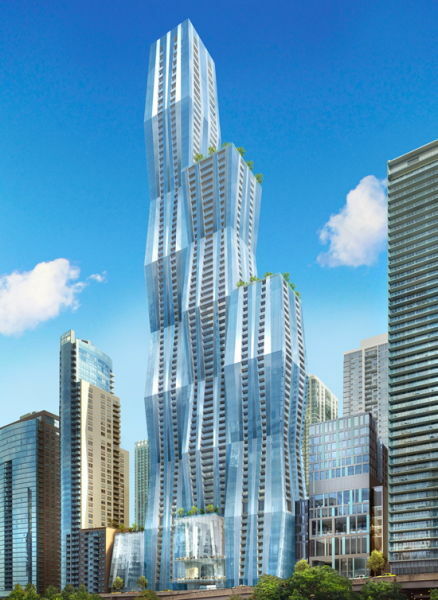 Chinese real estate developers Wanda Commercial Properties announced Wednesday plans to build an 89-story mixed-use tower in Chicago’s Lakeshore East neighborhood that would unseat Aon Center as the city’s third tallest building. At approximately 1,150 feet tall, the tower at 375 E. Wacker Dr. would be among the tallest buildings in Chicago. AN reached out to Alderman Brendan Reilly’s office to confirm the announcement, which was reported in the Wall Street Journal and Chicago Architecture Blog Tuesday, but so far our calls have not been returned. A spokesman for Lakeshore East developer Magellan Properties declined to comment. Chinese news agency Sina reported the building will house a five-star hotel and apartments, and is expected to open in 2018. Along with a retail component, that should total 1.4 million square feet of space, according to Chicago Architecture Blog. The designer is still unspecified, but a rendering from Wanda Group shows three staggered volumes constructed from stacked frustums, or cut-off pyramid shapes. If built, it would occupy the lot adjacent to the new GEMS World Academy building, designed by bKL Architecture. The Beijing-based company, commonly called Wanda Group, is known in the U.S. for buying cinema chain AMC Entertainment Holdings, and has amassed dozens of hotels and department stores in China. The $900 million Chicago project would be the first step in what Wanda Group Chairman Wang Jianlin said will be a big move into U.S. real estate.